Making the decision to surrender an animal is difficult, but we’re here to help. If you’re faced with the challenge of having to balance your pet’s needs with changes in your life, we’re here to help. 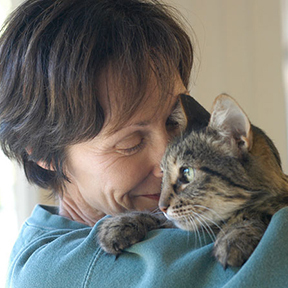 We have resources and support to help you make the best decisions for you and your pet. Our ultimate goal is to keep your beloved pet together, if possible. We can help with behavior or medical problems that may be making it difficult to keep your companion at home. Our Pet Care Assistance and newly-launched Pet Safety Net can provide financial support for veterinary care and other pet needs. Our Behavior & Training department can offer a no-cost behavior consultation for you and your pet. There’s no place like home! If you’re unable to keep your pet and must find an alternative home for him or her, our placement service offers tools to help you without having to surrender him or her to a shelter. We realize that sometimes rehoming your animal yourself is not an option. Because of this, we’ve included information about surrendering your animal. Marin Humane is an open admissions animal shelter, meaning we accept all animals regardless of their behavior, health or age. Although we cannot guarantee a new home for your companion animal, we consider each case individually. In cases of severe behavioral or medical issues, humane euthanasia may be the most appropriate option however we never euthanize based on the length of time an animal has been awaiting adoption or to make space. If you decide to surrender your companion animal, please understand you are surrendering all rights and responsibility of this animal to Marin Humane. Bring the animal to the shelter during business hours. Please bring any medical records you have for your animal. All animals are evaluated for health and temperament. If placed in our adoption program, animals will remain available for adoption until a suitable home is found and as long as she/he remains in good health and temperament. Our adoption rate is consistently above national average. If we’re unable to place an animal in our adoption program, we may find a foster home, or contact other rescue and placement organizations. Thank you in advance for helping us help your companion animal.